..but you already know that. 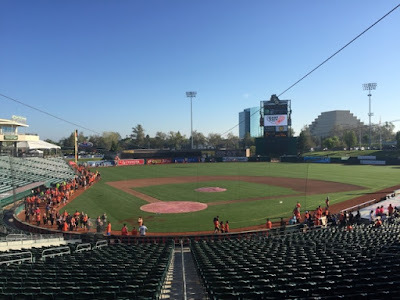 Since the Sacramento Rivercats (AAA team) were acquired by the SF Giants affiliate last year, my favorite team is literally in my backyard for the next four years (I think that’s how long the contract is for). 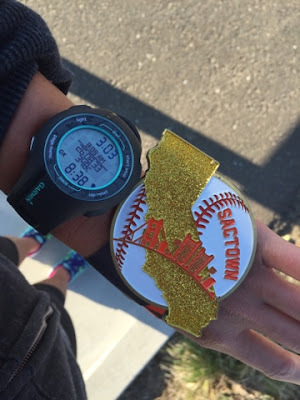 That being said, the Giant Race series has races at all of their affiliates – Scottsdale for Spring Training, Sacramento for their AAA team, San Jose for their AA team, and then they end with a final race in the City (SF) for the final race of the series. This year, Lil and I are running three of the four. Since we didn’t go to ST this year, we couldn’t run it, duh! They offered two different distances for this race. 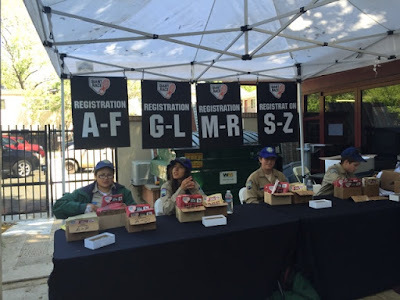 You could do the 5K or you could participate in a 10K relay, which was two loops of the 5k by a team of two. Lil and I thought the relay option was a little weird, so we opted to just do one loop together. That being said, as all inaugural races go, they have some things to work out…but we’ll get to that in the end. 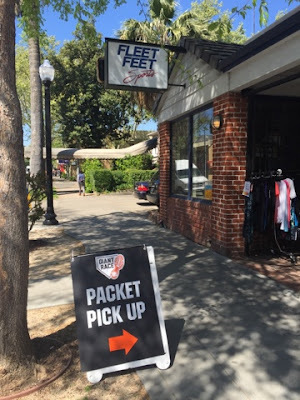 For packet pick-up, they offered it on Tuesday, super random, at the Yard (AT&T park for those non-baseball fans) and then on Friday (the day before the race) at Fleet Feet Sacramento. For us locally, that is totally normal and convenient. Same, same. I stopped by on my lunch break since I knew it would be super quick. 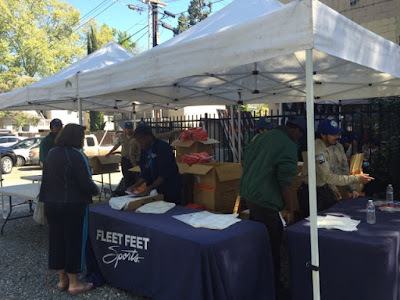 Went per the usu, walk through the store to the back, where a tent was set-up for bib and shirt pick-up, manned by a co-ed group of kids volunteering (I have no clue who they were affiliated with). I loved that the entire FF staff were sporting the race tees. This is by far my favorite race tee, I’ve EVER paid for! Or gotten ever! 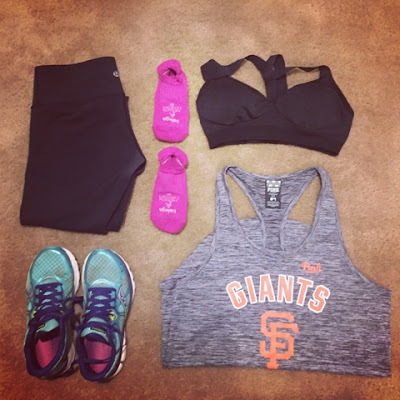 I might be a little biased because I am a die hard SF Giants fan. 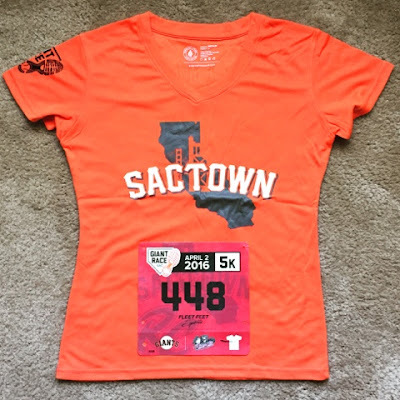 That’s beside the point 😉 But add my love for Sacramento and the Giants, this was a perfect race for me. Friday night we ended up changing plans at the last minute, so no carb dinner planned. Well, I guess I don’t really need to carb load for a 5k, but any use to eat carbs works for me 🙂 J and I ended up playing in a co-ed indoor soccer game. It was a little rough since we just got back from a vacation where we didn’t work out for four days, this was also a little worrisome for the upcoming run. I was a little apprehensive I wouldn’t be able to keep a 10 min/mi pace. Race day! Saturday race days are always a little weird to me. You’d think it would be nice to get it out of the way end enjoy the weekend, rather than wait through the weekend and race on Sunday morning. But no, I guess I’m conditioned to Sunday AM races. I digress, sorry! Up and at’em around 6:45 AM, for an 8AMr ace start. 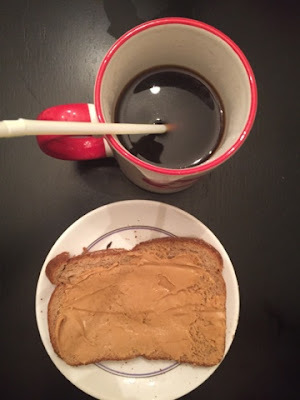 Since it was a short distance, I didn’t need to eat anything, but I chose to have a small cup of coffee and a slice of toast with PB. I ate most of it, did my ‘business,’ then got dressed for the race. 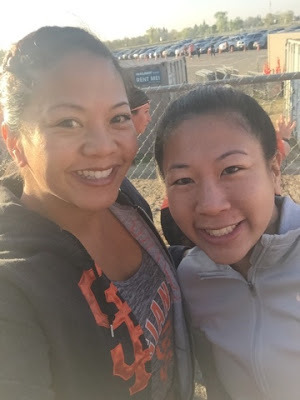 Lil and Momma Bear were coming over around 7:15 AM, Lil to race with me and Mama to hang out with L until our race was done. We said our goodbyes — Lil, J, and myself were off to the race. We ended up parking at the Bestests’ casa since her house is perfectly located right near Raley Field, home of the Sacramento Rivercats and the location of the race. Just a short walk to the stadium, we were kinda confused about where it started. Neither of us did our due diligence with this race. As we walked up, we ran into our running friends who live even closer to the stadium, Chris & Diane. Chris left to warm up and get to the very front to get to work on a PR, then Diane came with us and walked toward the front. We tried to maneuver our way through 2,000 people, toward the front. Along the way we lost Diane, then J said bye and went to wait in the stadium for our finish. Lil and I made our way up as far as we could, without being rude and shoving people. We stopped and I got my Garmin ready. We heard the official start, but it took us over two minutes to get to the starting mat. Lil said she’d stay with me, but I’m pretty sure I was holding her back. I haven’t run in weeks, so I was a little worried about how I’d weather the race, but I surprised myself. This race is nothing glamorous. Right away, it is an out and back (same as the very end of Shamrock) along the riverfront. You loop back, right where this weird new sculpture is being built. I’m assuming it will be done before Sac’s festival season starts. Once you loop back you pass by the stadium, cross the street and then you were running along the riverfront again. 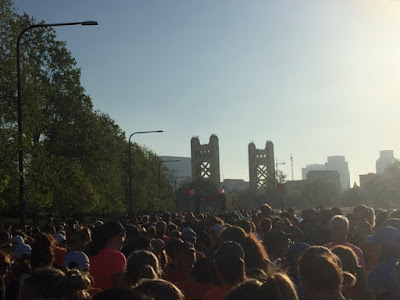 Except, this time across the river was Old Sacramento (where our November Project Sac group used to run at the end of our time). You run to the end of this section, then you zigzag down to the hill to run a 20 meters then zigzag back up the hill. Then you are led into the West Sac neighborhood, where the only water station and the band were playing. It is here you make your way back toward the stadium, through West Sac. You make your way back to the stadium, then you essentially make a huge loop around the stadium — you run down the shoot where we started, 5k to the left, 10k transition on the right (now the small, funneled shoot makes sense). Instead of where Shamrock finished at the right field gate, you go past that down the road that follows the stadium and enter in the very back of the somewhat center field, make a few turns and then enter the warning track in center field. You run for about fifteen yards on the warning track to your finish. Lil and I tried our hardest to make it before the timing clock hit 30 minutes, but I think we came in at 30:03 or something. We both knew we ran faster than the clock time, but still, seeing it in front of you is motivation, to say the least. My Garmin, tangents and all, said we didn’t even run a full 5k. They didn’t let the spectators in any section like they normally do, so it took us a few minutes to find J. The cutest little volunteers were handing out the coolest medals. I swear, the kid I took mine from had to be only four years old, such a cutie! 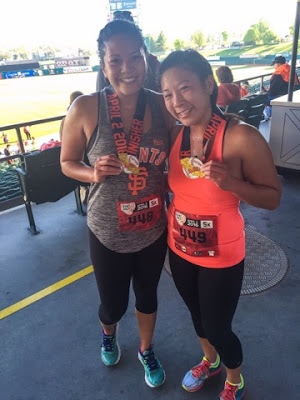 We grabbed our medals and made our way up the stadium stairs (so cruel), where we ran into Chris who PR’d! Gave him our congratulatory high fives, then finished up the stairs to meet J, Of course, we took some pics with our bling, maybe a selfie or two too. We also ran into Fit Fam 6, of which Paula was the only run racing that day. David had the RnR SF the next day. Chatted with them for a few, then we parted ways. J was dying to get home to watch his beloved Spurs, so we bypassed any goodies or food and walked back to our car. I was extremely excited about my race finish. I didn’t die and I didn’t hurt too bad, but my time was decent. No matter how much I don’t think Midtown helps me, it really truly does. I haven’t been running, but I had been consistently going to Midtown. So, there proof in the pudding — it’s helping. Dope shirt. Dope medal. Good, strong finish. I was a happy #GamerBabe! I had every intention of going to Midtown for their park workout, but then the fam asked if we wanted to grab brunch. Who am I to not hang out with my fam? Duh! 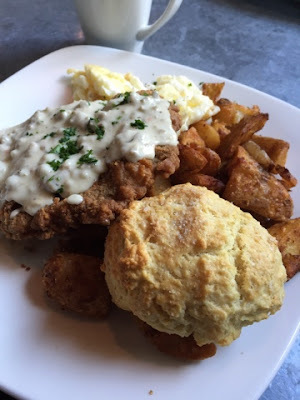 So, just the four of us grabbed brunch at Cafeteria 15L, J and L opted to stay home and watch their Spurs play! A hearty brunch to replenish our depleted calories, also to get me ready for a day of bridesmaid shopping. I’ve always loved my city, but little things like this just make it that much better!